Dr Pierce is a registered Phytotherapist (Medical Herbalist) with the AHPCSA. 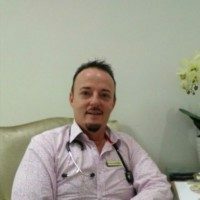 He has been in private practice since 2005 and exhilarated upon his acceptance in 2010 as a member (RH) in the Professional Members category with the esteemed professional association – The American Herbalists Guild (AHG) (USA). He has a keen interest in natural health care and through the years rendered a significant contribution to its furtherance. He served inter alia as Chairperson of the NHA and mediated on the governmental level for the recognition of healers (Traditional / Natural) by establishing a register with set guidelines for such practitioners in SA. His ultimate goal was to ensure and provide a more cost-effective and efficient healthcare service for all South Africans. The industry needed to be regulated and controlled and health legislation was placed under the microscope. He decided to broaden his knowledge and qualified as an Iridologist, La Stone Masseur and Usui Reiki Master. He had a passion for Latin American – and Ballroom Dancing and started training as an instructor and competitor. This lead to professional registration as an adjudicator with the SASDF. Dance Movement Therapy as a modality of treatment was incorporated in healing prescriptions with great success. Other hobbies include oil painting, nature expeditions and relaxing with good friends. “Welcome to my world… I believe in a holistic approach to patient care, minimal chemical intervention by getting back to our roots (literally) when prescribing medicine and a multi-disciplinary approach in my treatment regimen: working together with my fellow colleagues in the allopathic field and allied health professions… After all – my passion and priority are my patient's well-being, quality of life and longevity. Health is a complete state of physical, mental and social well-being and not merely the absence of disease or infirmity. We should be encouraged to build a supplement regimen designed to preserve some of the most significant factors involved in healthy ageing. Significant factors include: Promotion of cardiovascular health, Control glucose (blood sugar) levels, Promotion of weight management and prevention of obesity, Promotion of mobility, agility and good joint health, Preservation and promotion of vision, Preservation of mental- and cognitive ability, Prevention of free radical damage to cells and Prevention of mineral and vitamin loss and deficiencies. Dr Pierce is available for consultations at the Illovo, Fourways, West Rand, Bedfordview and Morningside branches.